At the end of Mary Poppins, Mary Poppins watches from the front step of the Banks family home as they walk down the street to fly kites together. During her time with them, Mary has wrought an amazing transformation in the family, and especially in Mr. Banks. Mr. and Mrs. Banks were distracted by the worldly pursuits of economics and politics. They ignored the weightier matters of love, relationships, and family. Their children, Jane and Michael, acted out, and became increasingly unruly. Their behavior, while poor, masked the selfish negligence of their parents–the real root of the family’s distress. In her unique and magical way, Poppins exposed the malignant dynamic at work in the Banks family; she catalyzed a moment of revelation and change for Mr. Banks. As the head of the house, he was the first domino to fall. With him, all the rest fell into place, and the family was healed. For a moment, Poppins lingers on the front step watching the family as they enjoy their new start. Mr. Banks lost his job at the bank when he decided to put his family before his ambitions. But part of the celebration observed by Poppins includes the reinstating of Mr. Banks as a full partner in the bank. For a moment, the viewer can see the shadow of grief and sorrow pass over Poppins’s face. She has worked her magic. She has given herself, and the family has been saved by her service to them. But she is excluded from the “after party.” She has labored but gets no direct enjoyment of the fruits. Her parrot umbrella handle points this out, snottily observing that the children think more of their father than of Poppins. 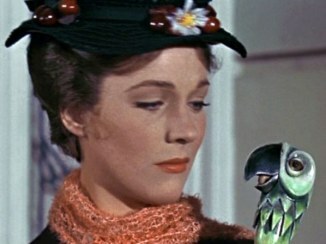 While forcibly closing the bird’s mouth, Poppins observes that this is as it should be, and comments that “practically perfect people never allow their heads to be muddled by sentiment.” With that, she is off to the clouds again. I find myself identifying with the moment wherein Poppins grieves her exclusion from the celebration of new life enjoyed by the Banks family. I have made sacrifices and experienced loss for the sake of Christ. While I see, from time to time, how others have benefited from what I have given, I feel excluded from that. To give without benefit is to know Jesus in one aspect. To grieve that may be an allowable human response to an extent. But the Lord is showing me that this can also be evidence of the self hanging on, insinuating itself in a way that darkens what has been wrought by Christ. Jesus was able to endure the cross for the joy set before Him (Heb. 12). He is happy for what others gain at His expense. But self cannot be happy for what others gain at its expense unless it also gains. Self isn’t able to give in a disinterested way. Since self cannot view any situation except in relation to its own being, it naturally turns toward pitying itself for what it has lost instead of enjoying what others have gained. I pray the Lord will enable me to have joy in giving itself, whether or not I get to enjoy the effects of my giving. I pray the Lord will shut the mouth of those thoughts that parrot self-pity or that dwell on what I have lost instead of on what others have received. Being a friend of the Bridegroom means not taking any of the glory for yourself, right? Good word, friend!